Reporting from Beijing, China – Last week pro-Tibet groups issued a report and urged the IOC not to award the Games to Beijing because China’s human rights record fails against the newly revised Olympic Charter. They claim that China did not live up to promises and claims made in the run-up to the 2008 Olympics. On Tuesday, the International Olympic Committee (IOC) Evaluation Commission site visit kicked off in the Capital with scores of domestic and international journalists watching every step. 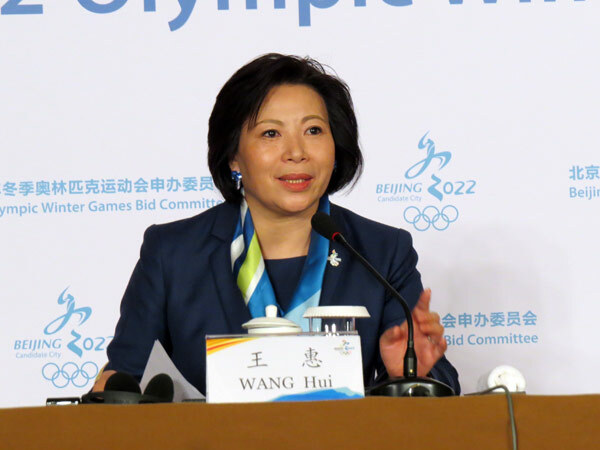 “All of the policies here in China are aimed at protecting the people rights,” Hui Wang, Beijing 2022 Communications Director said when questioned at a press briefing. “Of course there will be certain individuals who will take the chance to do something to serve their own interests and purpose, and we think this kind of behavior is against the Olympic spirit and shows disrespect for the Olympic members. “And as the bid committee for the 2022 Olympic Winter Games we support the Olympic spirit and support the Olympic Charter and we will keep sports independent from politics. Chinese IOC member and Olympic Champion speed Skater Yang Yang also spoke out on the issue. “In the Olympic Charter there is only once sentence about human rights which says that participation of the Olympic Movement is a basic human right,” she said. Indeed, the new Olympic Charter updated after Agenda 2020 reforms were approved in December in Monaco addresses human rights issues by stating that all people have access to the Olympic movement and cannot be excluded by means of discrimination. New language has also been added to the host city contract which protects citizens with respect to health, safety and labour laws as well as protecting the environment. IOC Evaluation Commission Chief Alexander Zhukov is due to hold a press conference on Saturday at the conclusion of the visit – until then all meetings and discussions during the visit are behind closed doors.